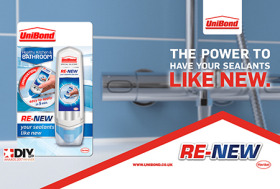 The global adhesives and sealants giant has invested £1 million in a new TV ad campaign to raise awareness of the award-winning Re-New product that will run on major channels in prime slots for three weeks. Launched on June 21, the 10-second ad, which proudly sports the DIY Week Awards logo, has run several times a day in the commercial breaks of popular programmes on major networks including ITV’s Coronation Street, Channel 5’s Big Brother and Sky News, as well as major sporting events on Sky Sports channels, and will air during Good Morning Britain tomorrow morning. The ad for Re-New, which was named Decorating Product of the Year at the 2017 DIY Week Awards, will be screened this week during Channel 5 News and Good Morning Britain - and Pointless, Big Brother and Tipping Point in Ireland. It will air until July 14.